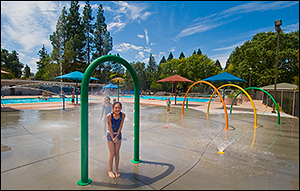 In May 2008, the Sprayground at the Pleasant Hill Aquatic Park held its Grand Opening and Ribbon Cutting. This event culminated the partnership with the Pleasant Hill Community Foundation, Pleasant Hill Recreation and Park District and 300 local donors and businesses. New water play features and engraved bricks were introduced to the community.